Hydrocarbon solvent specifically designed for use in many paint formulations and associated thinners. 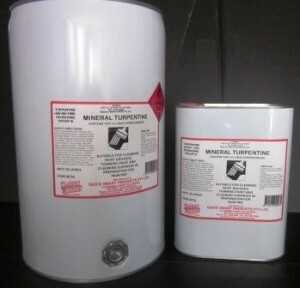 Mineral Turpentine is one of the most widely used hydrocarbon solvents as it combines good solvency with controlled evaporation. Use Mineral Turpentine for thinning paints, linseed oil, waxes and polishes, metal cleaning and clean-up of brushes and equipment after painting. Good solvency for oil, grease, wax and silicone. Versatility – Mineral Turpentine can be included in any formulation where controlled evaporation is required and is miscible with all other organic solvents. Solvency – Mineral Turpentine has good solvency for greases, oils, and general dirt – as well as for alkyd resins in enamel paints. Please consult the MSDS on Acetone before use.